Now with a second CD of slower practice tempos! 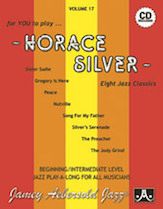 This set contains some of Horace's most famous songs. Tempos are all slow to medium and musical styles & grooves represented include slow 2-beat, rock blues, lush ballad, 32 bar shuffle, bossa and swing. Many of these can be heard on Horace's break-through albums of the 60s and 70s with Joe Henderson, J.J. Johnson, and Woody Shaw.